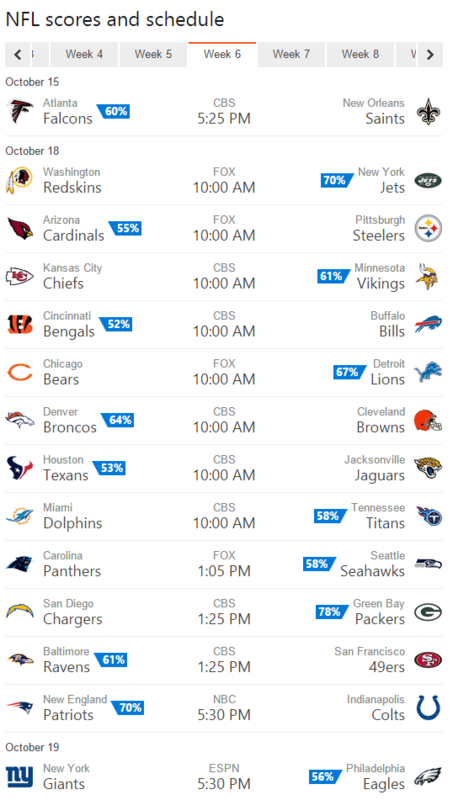 It’s Wednesday, so it’s time for Bing’s weekly NFL predictions. Bing is not making any bold upset predictions when compared with the favorites in other polls for week six. The Bing Predicts team sees all of the undefeated teams continuing their win streaks, with the exception of the Carolina Panthers. Bing is predicting that Seattle will end Carolina’s undefeated record. The Bing Predicts team’s reasoning is that Seattle has defeated the Carolina the last 5 times the met, including last year’s playoff match and three victories on the road in the past three seasons. Of the four incorrect picks, two games were decided by one point each (Kansas City and Tennessee), one lost in overtime (Baltimore), and the fourth was decided on the final play of the weekend (San Diego). Overall, Bing Predicts is 48-29 for the season and seems to be steadily increasing its accuracy of picking games after a rough start early in the season. If you want to know more about how the Bing Predicts team looks through its crystal ball, you can read our story from last week. In it we detailed what data the team works with and how they use machine learning for making their selections. What do you think of Bing’s record this year for NFL predictions? Are they a good enough source to rely on when weighing your selections for your weekly fantasy Pick ‘Em league? Let us know in the comments section below. What do you think of Bing’s record this year for NFL predictions?